In recent times, the beer industry has been growing at a rapid pace. This presents great opportunities for beer companies looking to improve their standing in the market. Therefore, it is important that your company markets your products in the best possible way in order to maximize sales! In this blog, we will be looking at Anheuser-Busch InBev’s beer merchandising, and some tips that can help your company move to the next level. Anheuser-Busch InBev has effectively marketed its Budweiser and Hoegaarden beers through a beer set. We will be exploring how their strategy attracts customers, and how your company can learn from them. What do we like about Anheuser-Busch InBev’s beer merchandising? Variety: We like that a variety of beers were used. This is because customers love bundled products, as it provides a perceived increase in value to the product that they are purchasing. It also make customers’ decision making easy, as they do not have to choose between products to purchase. This therefore helps to drive sales and increase customer demand. Slogan: We also like how engaging the slogan is. 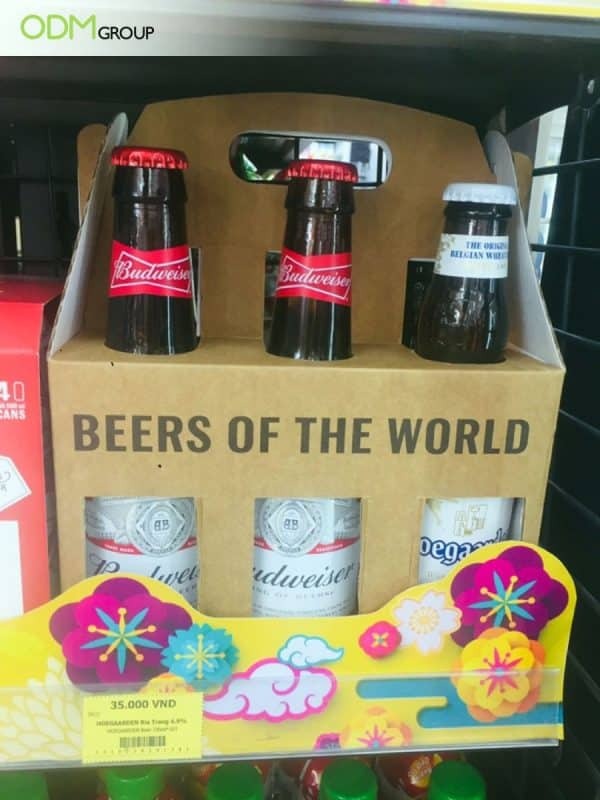 The slogan “Beers of the World” help to attract customers, as the slogan would make them think that they are a part of something big, thus attracting them to make the purchase. Enrich your marketing gift with these packaging styles! Aside from the above pointers, there are also many ways that your company can improve your beer marketing. There are many promotional tools that can be used. These range from gifts to displays. POS Advertising Signs: A beer advertising sign is a great way to market your brand, and attract customers to view your products. Beer Merchandise: Your company could also sell beer merchandise, such as a promo beer glass, that customers can use in their daily routines. If you are in need of promotional beer products, ODM is here to help you. We have extensive knowledge in designing, marketing and manufacturing promotional items for various industries. Feel free to contact our team today! Great summer promos by Corona! A cool inflatable display by Cool Lao in Japan! In need of ideas? A custom beer tap could be the solution for you!